the Sanctuary is not evenly lit. This does not help us to highlight or draw our attention towards the spiritual and liturgical focal points, such as, the Tabernacle and the Crucifix. 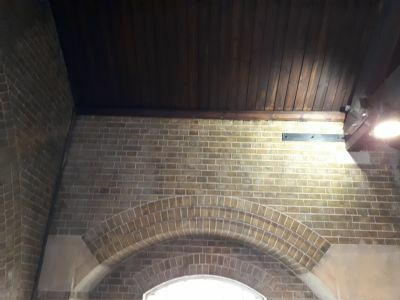 the existing lights on the Sanctuary are on the vertical tracking which are fall too low, and the lights shine directly on the celebrant’s face. 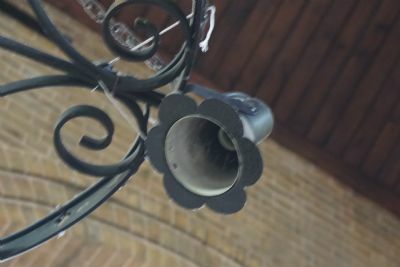 Our electrician and parishioner Matt Kemp, advises us that he is no longer able to maintain the light bulb fittings on the hanging metal circular lights as they are too old, degraded and breaking up. As will be seen there are missing bulbs on these fittings, consequently we are now unable to replace these bulbs, due to the age of the fittings and bulb holders that are broken. Having sought advice from a specialist lighting consultant, the recommendation was to replace all the hanging lights with multiple lights mounted on discreet tracks running at a higher level (than the current fittings), where the walls meet the ceiling. 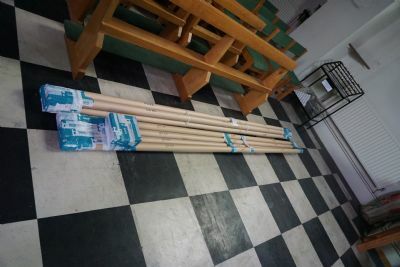 This new position would light both the nave and the ceiling, making the church look bigger. Matt Kemp has been working closely with the lighting consultant to check on the practicalities of this new system. We will have one of these new types of light mounted on the scaffolding tower, so you can get a bit of an idea of what it would look like. Records indicate that the wrought iron candelabra (along with the external gates and railings) are c1990, and were commisioned designed and made by blacksmith Tim Hallet of Hale Village near Warrington. 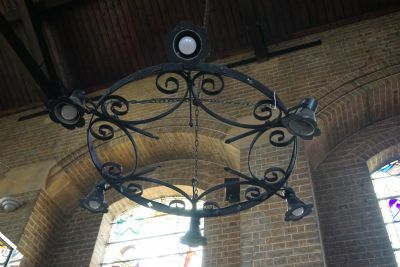 Unfortunately with the passage of time, these iron designed light fittings are no longer suitable for the church or servicable, though they have served the church well over the years. Modern technology and inmprovement in lighting make it the correct moment to replace these older light iron candelabras for reason mentioned above. 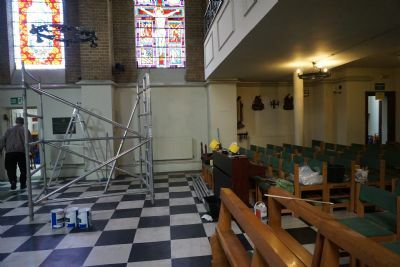 The project team and lighting specialists are also considering ways to improve the lighting under the gallery and for the Divine Mercy Window /gallery stairs and for the porch / entrance hall. The delivery of the new tracking for the new energy efficient and directable spot lights. The tracking will be set high up on the wall just below where the wall meets the eaves. 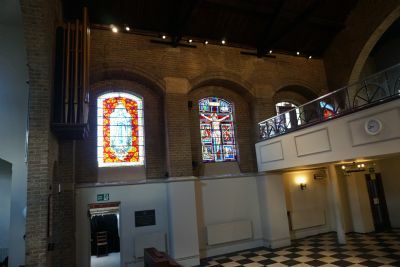 The new church lighting is now installed which has already transformed the church in to a much brighter space, the removal of the old iron candelabras has given the church a different more spacious and brighter look. The new lights also highlight the newely cleaned exposed brick walls. 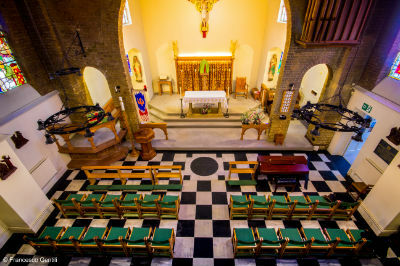 Without the hanging candelabras we have claimed back the upper space of the church which we were not able to enjoy, and the view is no longer obstructed obstructed. It is said that 'a picture may convey or paint a thousand words'. 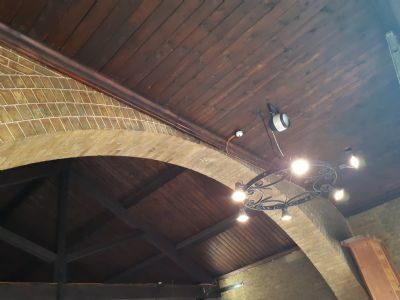 If this is the case, then the photographs below hopefully help illustrate how the new lighting has illuminated and showcased the renovated, cleaned walls and brickwork to a new level, compared to the old lighting. The new spot lights new placements were carefully selected to better reflect spiritual elements in the church, in adition to effectively lighting up the interior of the church. Sanctuary lighting comparison, the old lighting versus the new lighting ~ the data and figures around wattage and energy below are best guestimates and subject to correction and or revision. One of the key considerations to improving the lighting in the church was to both reduce energy consumption and ensure the lights were better directed and provide improved illumination. 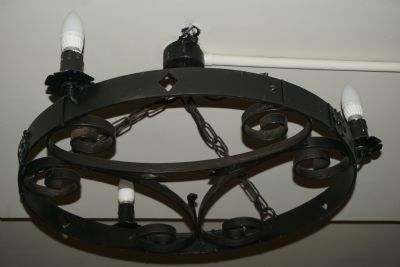 The old lights comprimised a mixture of normal and low energy light bulbs, with lower illumination or lumens per bulb. Matt Kemp our lighting subject matter expert, reviewed the existing set up and devised the new improved solution to best meet agreed aims and requirements for the church. The old sanctuary lights, high energy (spot lights and halogens) can be contrasted against the new low energy (LED) spot lights and set up. 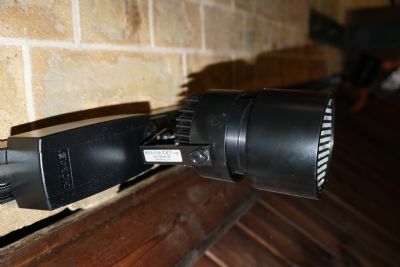 A total of twelve halogen high energy spotlights. Two lighting tracks situated either side of the sanctuary (lower position), each track hosting six spot lights. These were fixed position spot lights, and non-dimmable. 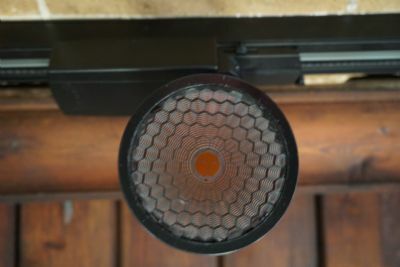 12 old halogen spots. Wattage per light bulb was between 60 to 100W per bulb. The maxium wattage was around 1000W to 1200W. A total of eight directional LED spot lights. 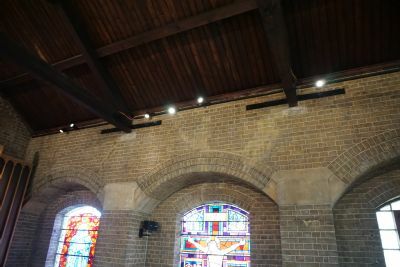 Two lighting tracks situated either side of the sanctuary (fixed high up), each track hosting four LED spot lights that are dimmable and directional, see photograph below. 8 new LED spots. 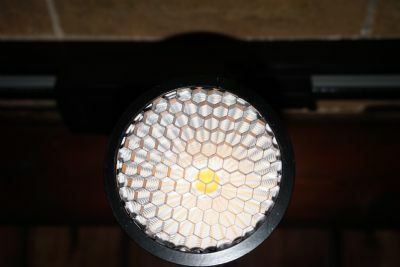 Wattage per light bulb 25W - these are dimmable >5K hours use. The maxium wattage is now 200W. 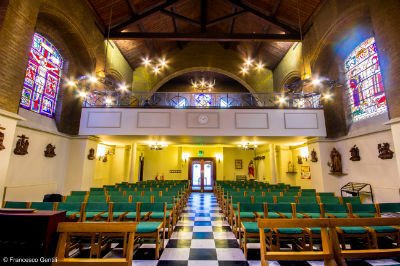 The new sanctuary lighting aim is to replace the old twelve high energy halogen spot lights and two lower fixed tracking system with for two new (white) tracking units fixed much higher up on either side the sanctuary wall and allowing for a total eight new lower energy (LED) spot lights. 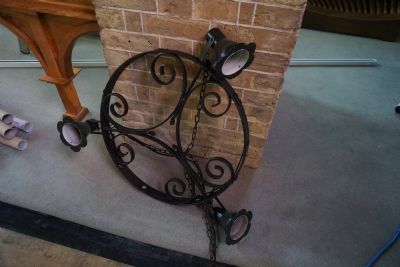 The new system provided a total of eight matching white (LED) spot lights, hosting four LED spots per track, these are all individually movable, directional and dimmable, located on either side of the sanctuary, see below. The main body of the church and the gallery was previously lit by a total of eight iron candleabras. comprised of three large and three small cast iron rings or candleabars. Five of these were known to have been commissioned designed and built by blacksmith Tim Hallett of Hale Village near Warrington. It appears three additional and similar designed candleabras were added at a later date. The three large iron candleabras were designed with six light bulb holders or fittings each, providing a total of eighteen light bulbs. Two of these larger light candleabaras hung over the chancel area and one hung at the rear of the upper gallery area. 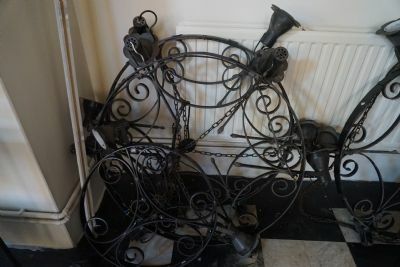 There were also two smaller iron candleabras with three light fittings per candelabra, for a total of six lights bulbs. Two of these were hanging just above the front of the upper gallery. One smaller candleabra was hanging above the ambo or pulpit, this also held three light bulbs fittings. 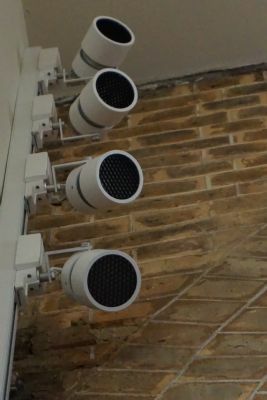 The underside of the gallery, with reduced headroom, holds an additional two similar designed iron candlebaras, with three light bulb units on each for a total of six light bulbs now using lower energy lights. As an estimate for the three smaller candleabras, now removed. These hosted three light bulb uinits each candleabra, for a total of nine potential light bulbs, (not all the light fittings worked). However, assuming all lights were operational, each using between 60W to 7 Watts for each light bulb, the total wattage was around, 540W (max) to 63W (min). Naturally the lower wattage bulbs used less energy however they provided much lower lumens or illumination, some areas of the church were noticeably darker. The three large iron candleabras, hosting six lights per candleabra, for a total of eighteen light bulbs, (again not all these units worked). The wattage used varied from 60W (max) to 7 Watts (min). The total wattage estimated then as between 1080W (max) to 126 Watts (min). We may recall the lighting was often inadequate on dark winter days and nights. The new updated light fixtures are designed to better light (increased lumens) both the main body of the church and the gallery (upper) area. 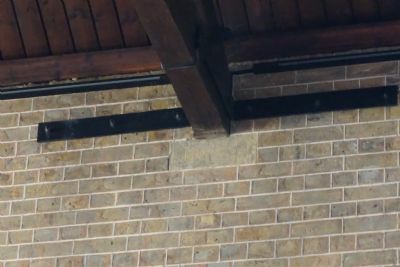 There is a total of around seven black tracking rails fixed high up on the walls around the church. 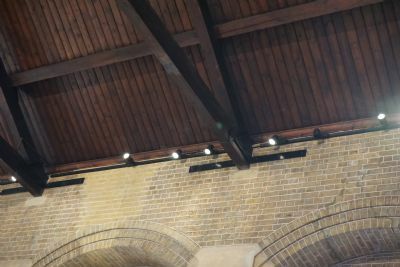 Each track (in the main body of the church, three tracks either side of church nave) currently hosts three (LED) black spot lights per track. 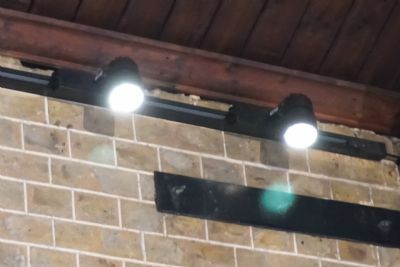 Providing eighteen matching black coloured (LED) spot lights that are again individually directional and dimmable, in the main body of the church. 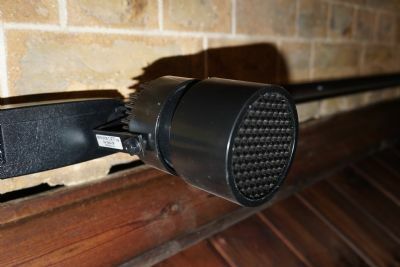 The gallery has tracking that host an additional three new matching black (LED) spot lights. These light both the upper gallery and showcase the Divine Mercy window at night. All these new tracks are now fixed much higher up on the walls, located just below where the eaves meet the church walls. 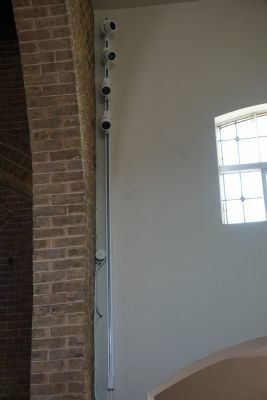 The total new (LED) spot lights in the church and gallery provide twenty one new (LED) lights. The wattage is twenty five watts per LED spot light for a maximium of five hundred and twenty five Watts. The increased illumination is marked in the church. 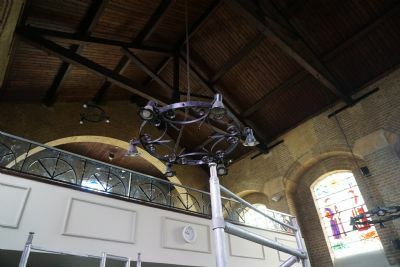 Currently two older iron candleabras (with three light fitting /bulbs) are still hanging underneath the upper gallery at the rear of the church where the ceiling height is much lower.These will be retained for the present.